The famed 90 metre sailing superyacht Athena, jointly listed for sale by Burgess and Merle Wood & Associates, has had a $10,900,000 price reduction. One of the largest sailing yachts in the world, this yacht for sale has a pure Dutch pedigree, combining the talents of Pieter Beeldsnijder for exterior design with the naval architectural skills of Dykstra Naval Architects and the craftsmanship of the celebrated Royal Huisman yard. Built in aluminium to Lloyd's class and MCA coded, Athena was delivered to much industry acclaim in 2004. She boasts superb engineering, state-of-the-art sail handling gear and interior joinery of the highest quality in lightly stained mahogany. Accommodation is for 12 guests in five cabins configured as a full-beam master suite, three doubles with queen size beds and a twin cabin with two Pullman berths, and all with en-suite bathroom facilities. A regular at the world's top superyacht regattas, Athena is as fast as she is good looking. On deck 55 Rondal captive and drum winches allow lightning fast tacks under full sail while sails can be set and stowed at the press of a button or two. The tri-mast schooner rig by Rondal provides some 2,500 square metres of sail power and is complete with in-mast furling for the topsails and in boom furling for the carbon fibre gaffs. Under power, twin 3516B Caterpillar engines give her a cruising range of 4,000 nautical miles at 10 knots. 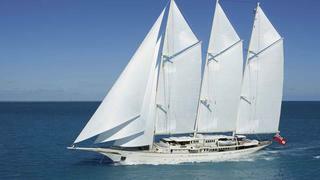 Currently cruising in the Caribbean, Athena is now asking $59 million.